We're at the halfway point. Six Digit-al Dozen manis down, six to go! Well back in February of this year, the theme was Love and Heartbreak. I've been seeing so much amazing stamping lately, I was itching to try it again for this look. After today's mani, I'll show you my fave from the original Love and Heartbreak week and share another fun fact! This post uses a variety of cool products. I'll put all the details at the end of the post. Vivid Lacquer plate VL001 served as the inspiration. 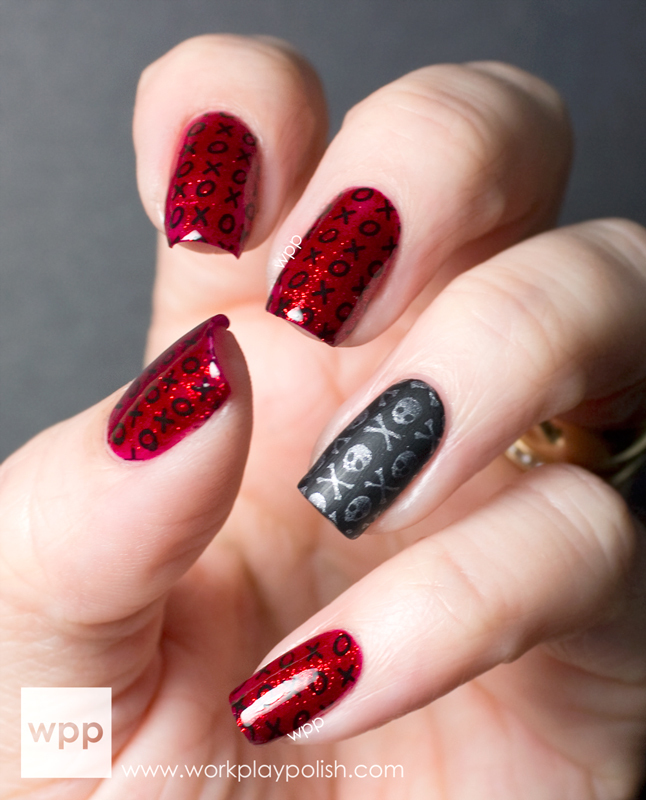 I loved the idea of a lovey-dovey mani with a heartbroken accent finger and this plate could accommodate both! The red polish is the iconic China Glaze Ruby Slippers and the x's and o's pattern is stamped with Born Pretty Store black stamping polish. I got a really clean transfer with it...the consistency is almost like pudding. Perfect for stamping! Those nails are topcoated with Glisten & Glow HK Girl. The accent nail is China Glaze Liquid Leather. The skull and crossbones were stamped using Konad special polish in silver and the look was finished with NUBAR's new Matt Finish matte topcoat. It's perfectly matte with a great formula. The finished product is simple, but I'm totally digging it. And here's my fun fact about Love and Heartbreak week the first time around. In January, Zoya contacted me and asked if I'd like to create some Valentine's Day nail art to go along with their Valentine's Day promotion. They asked me to choose three colors for the design. These three shades would be given away FREE with any $25 purchase. Gah! I. Was. Dying. I learned later that the promo exceeded expectations. I just love Zoya...both the polish and the people. Click the pic to see my original post. I used a ton of cool press samples in this post. Here's where you can get your own! Vivid Lacquer stamping plates retail for $8 each. (Totally worth it). You can purchase them in the Vivid Lacquer Etsy store. Born Pretty Store Black Stamping polish retails for $2.05 on it's own (buy it here) or you can purchase a two pack (with white stamping polish) for only $3.41 (buy it here). Be sure to use my promo code "CRL91" for an additional 10% off! NUBAR products are available online at www.bynubar.com. I don't see the Matt Finish matte topcoat on the site yet, but it should be there soon. HK Girl topcoat retails for $6.95 from Glisten & Glow. 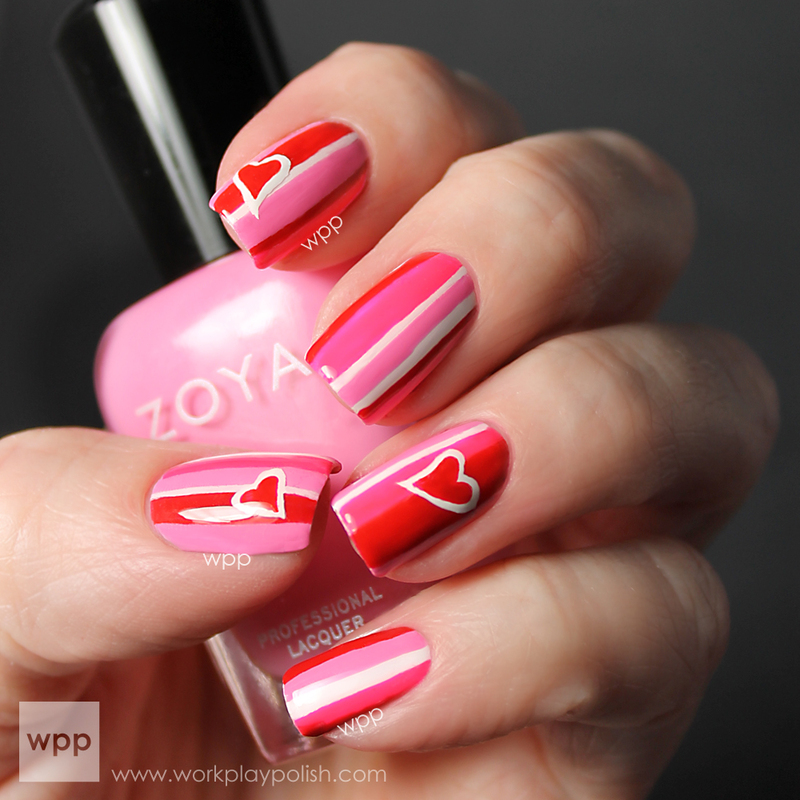 All polishes used in the Zoya Valentine mani are part of Zoya's core collection. Purchase Zoya for $8 each at zoya.com.